We are located in a quiet residential area and close to the station as well. about 5mins by local train (get off at Nijo Sta. 180yen) followed by a 6mins walk to the guesthouse. You should take the Sagano-Sanin line from platform #31-33 and get off at Nijo Sta. Go out from the Exit(East Side) and turn left(you can see the Gold Gym). Cross the Senbon-dori St. and walk down Oike-dori St. to the 1st light. Turn right at the corner. After few minutes you will see a park on your right. Turn left at the small alley which is between the park and the Sanjo Market. You will see the white building, that is our guesthouse. It would be best to copy/print-out the map provided on this page and show it to the taxi driver. 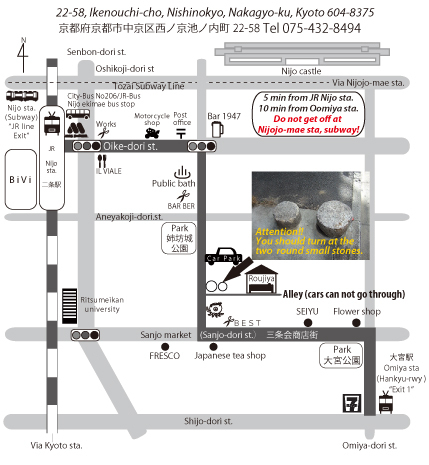 Walk from Omiya-diri St. to the Sanjo Market. Turn left at the corner. Go straight until you reach the barber shop the name is Best on your right and then turn right. Turn right at the 1st alley, you will see our guesthouse on your left.